The overarching theme running through all of my projects is observation of the natural world and consideration of the human experience within that world. This is often, but not always, realized through constructed still-life photographs of natural subjects, serving as metaphors for these experiences. In terms of technique, much of my work is created using a flatbed scanner as my camera, and has been since 1999. About 7 years ago, I began incorporating encaustic painting into much of my work. I also sometimes utilize alternative photographic processes like platinum and palladium printing, cyanotype, and metal leaf on vellum. Although I was raised in the suburbs of Atlanta, I spent a lot of time outdoors in nature as a kid. My mother and grandmother took me camping quite often, and we spent a lot of our family vacations on Cumberland Island, off the coast of Georgia, which is a truly magical place. I have always been the most at peace in nature, and I think that consistently influences my subject choices across my projects. At the same time, I try to infuse many of these subjects with a deeper meaning which reflects my personal experiences. 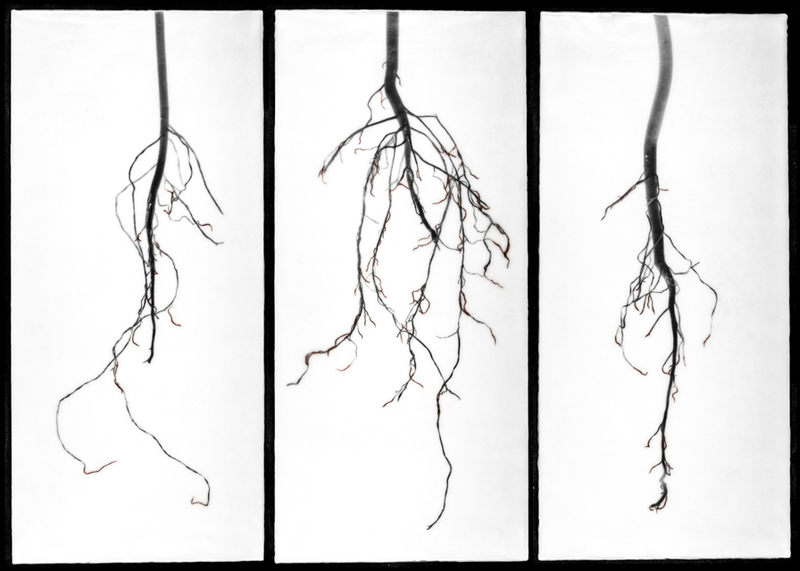 This is most readily apparent in the Roots & Nests project featured here, in which I use subjects like roots and nests as metaphors for family and my experiences as a mother. My studio practice does not necessarily occur in one location, but is rather a multi-location, multi-step process. My scanner work begins as a hunter-gatherer process, looking for subjects that might make interesting photographs as scans. Sometimes friends will bring me things that they find, if they know that it relates to a current project. They’ve brought me everything from dragonflies to all kinds of nests, from hummingbird nests to wasp nests. But I most often find my subjects while on walks, or even in my own backyard. My current project in progress is about the moon and the night sky, so I’ve been doing everything from charting and photographing moon phases for the past year, to experimenting with astrophotography through a telescope, to playing around with NASA’s royalty-free deep space images, to creating constellations with salt on my flatbed scanner. In terms of my physical studio space, this exists in a few different places. I have a “clean” area for my digital work and a “dirty” area for my encaustic, both in my house. I also utilize the darkrooms at my school for most of my alternative process printing. While it’s a little difficult having my studio spread out between three physical spaces, it’s also nice that when I get tired of being in one space, I can move on to working on something different in another space. I teach photography at Washington and Lee University, and essentially have my dream job sharing my love of photography and art with others full-time. I often feel like pinching myself when I remember that I get paid for this gig. What I underestimated coming into my career is how much that my students would actually teach me, and not the other way around. I have been consistently surprised over the years at how much the content of my courses has influenced my own work. 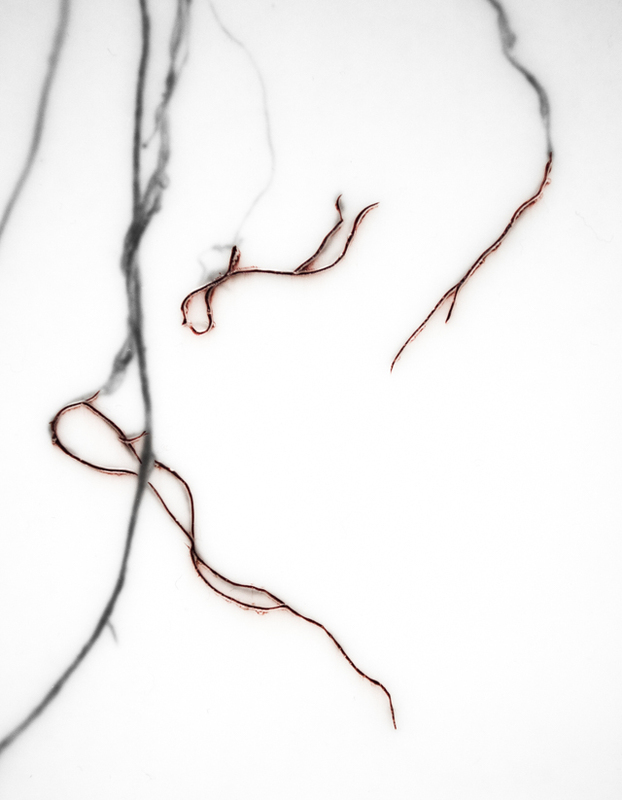 For example, I began utilizing alternative processes in my work after teaching an alt pro class in my first year at W&L. I also learn new material constantly through teaching, and through my student’s questions in particular. They definitely teach me as much or more than I teach them. Because I am teaching and running the photography program at W&L full-time during the academic year, I make the majority of my new work during the summer. Throughout June, July, and August, I am pretty much able to dedicate myself entirely to my studio practice during the week. I also get fantastic research support from my university for this. During the school year, I generally have Fridays set aside for studio time. In smaller time windows, I handle the administrative side of my studio practice, like shipping work to shows, updating my web site, etc. Between teaching and having young children at home, finding time to create new work is definitely a balancing act. I treasure the uninterrupted studio time in the summers, as I find shifting gears between creative work and teaching during the academic year quite difficult. The utilization of natural subjects to serve as metaphors for human experiences, and particularly a woman’s experiences, are the ideas that have remained constant in my work over the years. I don’t want to say that this will always be the case, but it seems to have worked out that way for as long as I can remember. 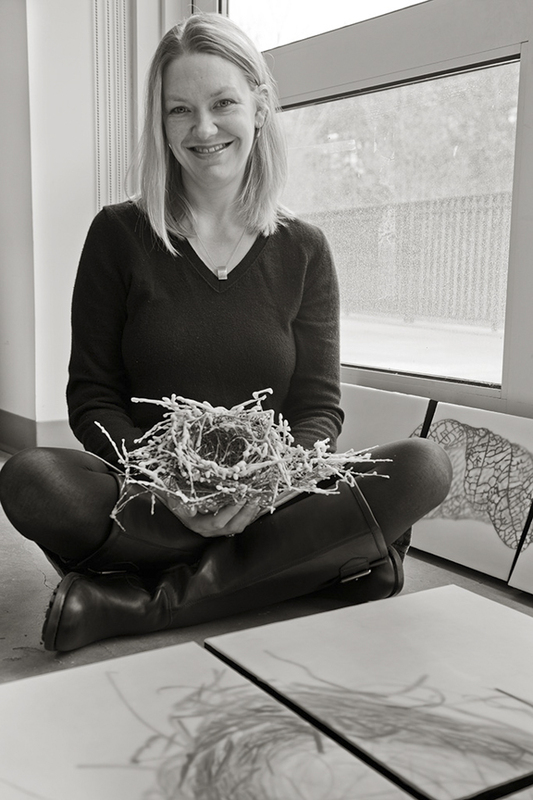 Five years ago, I was just starting to explore motherhood and family through the Roots & Nests project. During that time, I experienced the pregnancy and birth of my second son, which had an immense impact on the work. Many of the pieces were made while I was on sabbatical and at home with my son during his first year of life. My studio practice had to be balanced with nursing, rocking, and other aspects of caring for a newborn. Everything about the Roots & Nests project, from the subjects themselves to the encaustic wax, were impacted by my overwhelming desire to nurture and protect this tiny human in my care. As he has grown into a more independent child, I have moved into a less introspective project about the moon and stars. So essentially, five years ago I was looking inward with my work. And now, I am literally looking outward into the night sky. In terms of technique, I have found over the years that I feel more and more of a need to incorporate the artist’s hand into my work. I am no longer satisfied with an image that is purely digital, from scanner to finished print. Whether it is painting encaustic over a digital print, or a print made through an alternative process, a piece is not finished for me anymore until I get my hands dirty. I am by no means the only photographer who has found herself in this position, and I believe that there is something to be said for this being a response, conscious or unconscious, to the rise, prevalence, and ease of digital photography in society. As I explained previously, my family has a huge impact on my work. I also believe that my move to rural Virginia nine years ago impacted my work a great deal. I live in the amazingly beautiful Shenandoah Valley. It is a calming and grounding force in my work. Even though the relationship between a circular nest balanced within a square to a landscape of green rolling hills flanked by mountains may not be immediately apparent, it is most certainly present. As far as other artists, I try to look at as much work as I can. I keep up with several photography blogs, read periodicals, attend conference presentations, and see as many exhibitions as I can. I am sure that these things seep into my work like a big visual stew. If I had to name specific artists who I feel have influenced my work consistently over a number of years, I would probably say that Michael Kenna and the Starn twins have had the biggest influence on me. The calm minimalism and compositional balance of Kenna’s work is wonderful. His understanding of how to use line in photography is phenomenal. With my latest project, I’ve also been thinking about his approach to photographing at night, and how this can transform a subject. I find the Starn’s innovations in media and process, as well as their approaches to layering and degrees of transparency, so engaging. These are artists whose work I never get tired of looking at and thinking about. I have known that I wanted photography to be a big part of my life since I took my first photo course my freshman year of college. The only question was what kind of photography I would pursue. Throughout college, I thought that I wanted to be a photojournalist. I was a photographer for my college newspaper, and I took a lot of relevant courses. But I was always an art school girl at heart. That’s where I felt at home, especially in the darkroom. I am glad that I stayed true to that calling. It has become clear to me over the years that my preferred method of working is definitely constructed rather than found photography. I make rather thantake images, and this is a fundamentally different approach than that of a documentary or journalistic photographer. In terms of other interests, I am definitely a foodie. I love going to restaurants and trying new things, and I love cooking. I might have enjoyed being a food critic. Maybe that will be my retirement career. Christa Bowden was born and raised in Atlanta, Georgia. She earned her MFA in photography from the University of Georgia and a BA in photography and film from Tulane University. She is an Associate Professor of Art at Washington & Lee University, where she started the program in photography in 2006. 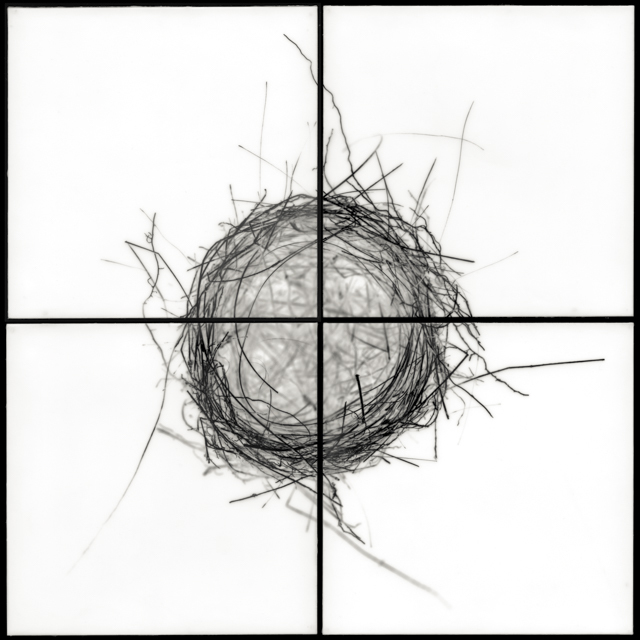 Her work explores the use of a flatbed scanner as a camera, as well as alternative photographic processes and the integration of encaustics and photography. She was the recipient of a 2009-2010 Virginia Museum of Fine Arts Fellowship, and a 2005 nominee for the Santa Fe Prize for Photography. She has exhibited extensively throughout the United States in both group and solo shows. Her work has been included in numerous highly-regarded photography web blogs and artist indices, including Plates to Pixels, Light Leaked, and Art Photo Index, and was highlighted in 2014 as an Editor’s Pick by LensCulture Contemporary Photography. Her work also appears in the recently publishedAnthology of Appalachian Photographers from Sapling Grove Press, as well as Exploring Color Photography, 6th edition by Robert Hirsch. She is currently the Southeast region chair for the Society for Photographic Education, and lives in Lexington, Virginia. This entry was posted in Encaustic and tagged Alternative Processes, encaustic, Family, nature, still life. Bookmark the permalink.